Yup, 5-star wide receiver Garrett Wilson was one of the top high school prospects coming out of high school and this is exactly why. 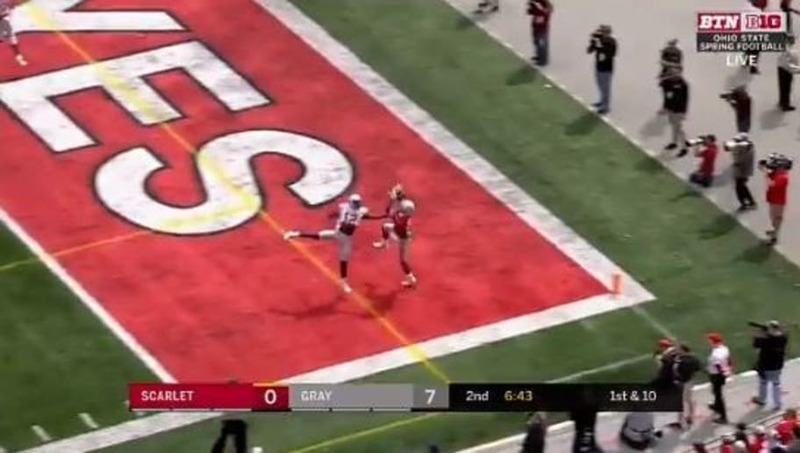 Wilson ​signed with Ohio State last winter and this touchdown grab will only fire up fans even more about his potential with the Buckeyes. He made that look real easy. It was redshirt-freshman quarterback Matthew Baldwin slinging it around, something Wilson is used to, as they played together in high school at Lake Travis in Austin, Texas. Clearly they have a great rapport together. Ohio State QB Matthew Baldwin and WR Garrett Wilson hooked up on 98 passes for 1,774 yards and 26 touchdowns to lead Austin Lake Travis to a berth in the Texas 6A state championship game in 2017. Today, the pair scored their first touchdown in Ohio Stadium. Wilson didn't look like a true freshman on that catch. That kind of ability to go up and get it something you see on Sundays. For the Buckeyes, the offseason has been filled with plenty of drama. From Justin Fields arriving, to Tate Martell bouncing for Miami, the OSU faithful have been waiting for the off-the-field noise to stop. Saturday's Spring Game was a great early look at 2019, a campaign Wilson will look to be a big part of.